Steve Rice (Olympia, United States) on 3 February 2012 in Documentary & Street. Or so she seems to be thinking. 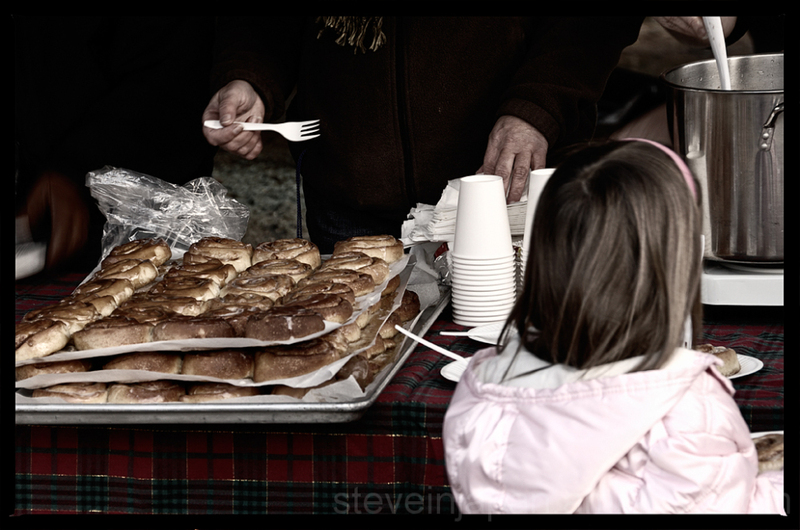 Goodies were served at the dedication of the Chambers Railroad Bridge. Part of the Covered Bridges of Oregon series. I would gladly take a coffee! LOL! Terrific framing and it seems the dedication was a very family-friendly event! Me too. ;-))) Love your muted colors here. The things on the left (bread/bagels) look very tempting too. Superb framing and great tones . Beautiful ! its a b'ful shot !!! great seen and like the framing here! De bien belle chose à manger avec la jeune fille, superbe compo e tiamge fantastique. I'd like one too Steve! Delicious! Bon appetit Steve :)) Good day. Very good framing. The contrast is fantastic. The perfect angle of view of the tasty treats at her level, delicious shot. those cinnabon buns look yummy.. :) nice candid shot.. Fantastic details, I'll have one!